Well, this review is quite the undertaking. 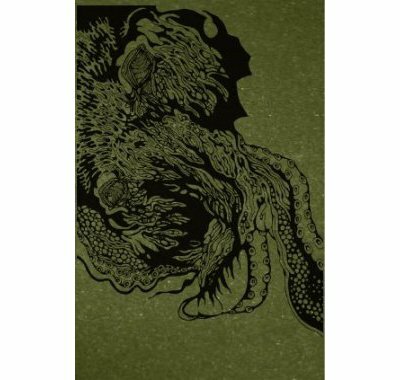 Handmade Birds has produced another monstrous split cassette from four of the most daring and unique bands in extreme music today. 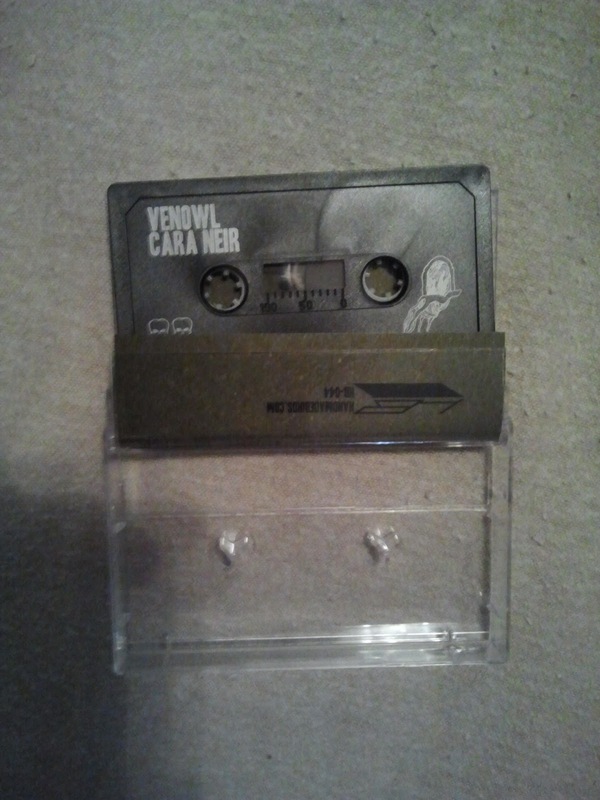 Each of these groups has a distinctive sound, even apart from the other groups sharing this cassette, which makes this split a unique and cherished addition to any collection. Since there's a lot to review here, I'm jumping from the intro right into the details. Here we go. 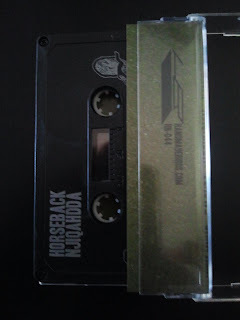 Side A of this cassette features one track each from Horseback and Njiqahdda. Horseback open things up with the off-kilter track "Heathen Earth," possibly a nod to the Throbbing Gristle album of the same name. As any Horseback listener knows, they tend to keep their music unpredictable and this is no exception. The opening of this tune is as funky as anything I could imagine them doing, yet builds up in a very ceremonial fashion, as if the band has prepared to summon the very song itself. 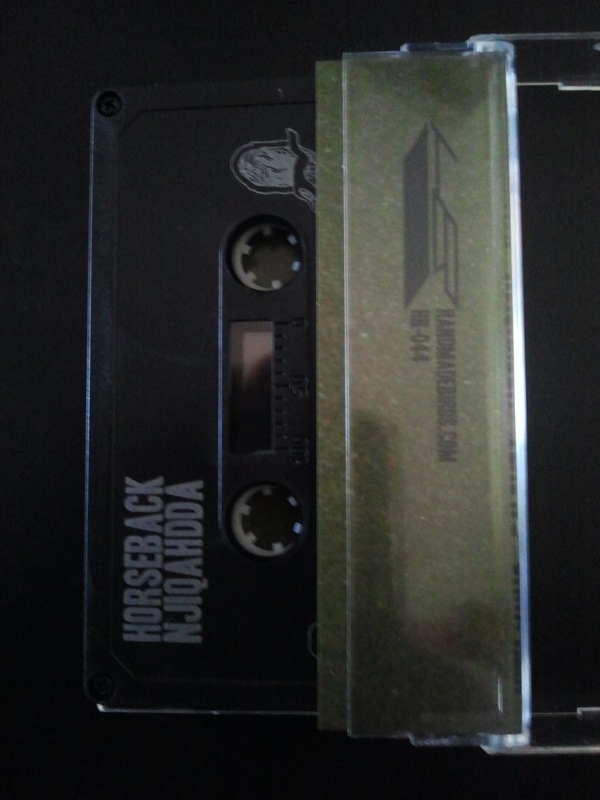 I envision walking up to a fire-lit ritual where Horseback is waiting to guide the listener into the deeper recesses the rest of the tape will explore. Layers of droning guitar and elevating feedback build over the steady pulse of drums and bass playing in unison as the song makes its way into more familiar Horseback territory, complete with intense black metal inspired vocals and the foggy atmospherics they've built their reputation upon. Even at its thickest and most intense, this song maintains a shimmering, trance-like beauty which will likely appeal to folks who aren't as well versed in music of this nature. The incredibly prolific Njiqahdda follow with the monumental "Towers Constructed to Break the Sky," which is also featured upon their recently released Towers and Tides EP. The production here is noticeably cleaner and this music is more technically slanted, yet the band manages to maintain an atmosphere of beauty and passion despite it. The drums are incredibly well played and produced, which I'm always delighted to hear. When the clean introduction caves in to the distorted guitars and faster drumming about a minute in, it feels so seamless. The bellowed vocals have the mud-covered inflection of groups far sludgier, bringing to mind Neurosis more than most progressive-leaning extreme metal groups, which is a nice touch. The song's title and musical textures work quite nicely to evoke imagery of man's constant ambition towards self-deification, which is a pleasant excursion for my mind to embark upon. The peaks and valleys of Njiqahdda's track are easy to follow and despite its great length, it's no great effort to listen and be captivated through its entirety. The B side of this tape contains a new track from Venowl and three songs from Cara Neir, whose aggression has already graced this blog. Venowl's contribution, simply titled "III," provides a stark contrast to the melodic tones of the prior two groups, delving into the fuzz and filth that I so often speak about throughout this blog. The pace is slow, the guitars and drums tend to attack at the same moment, making each pulse of the song painfully delightful. This feels like it was recorded in a poorly lit basement in the true fashion of classic black metal, but with a different take on the sounds of the genre. The vocals are shrill and tormented, the production is murky yet does nothing to mar the intensity here, and the band's dissonant attack on the listener provides little to soothe or relieve the tension they create. The entire song makes me feel like I'm being dragged headfirst down a stairwell into a dungeon while hearing the screams of other prisoners. I'd love to know what the lyrics are, as I have a feeling these guys have some pretty dark inspirations behind their hideous assault. Closing this split are three intense cuts from Cara Neir, starting with the pitch black fury of "Minus His Confidence." While the band certainly haven't given up their outside influences, this song is as close to pure black metal as anything I've heard from them and it absolutely shreds. Despite the absurd pace of the song, these guys still manage to fit in a break for a wild guitar solo and a few other little touches of brilliance. For a pair of young musicians, these guys are quickly carving out a niche for themselves, and hopefully other equally talented groups will begin to follow suit. The meaty punk-inspired blackness of "No Right Path" feels like another full-on assault, although it's a fraction of the length of closing masterpiece, "Seize and Exist." This seven minute tune returns to more of Cara Neir's trademark territory, opening with chaos all across the board that hones itself into a pummeling blackened attack, marching forcefully onward just long enough to surprise the listener when the song breaks down into a spacey dirge a couple of minutes in. For a band drawing from such a broad range of influences, these guys continue to impress me with their ability to meld it all together without sounding forced or pretentious. This entire cassette impressed the hell out of me, to be honest. I figured I'd be able to pick a standout track or particular artist whose music touched me in a particular way, but each group's contribution is so unique and enjoyable that I'm just going to recommend you get a copy and that you do it quickly. Only 250 of these gems were made and I see the price escalating quickly via discogs and ebay once these sell out. Get it for only 9 bucks from Handmade Birds. It's already sold out over at EEE Recordings, but you should check out that store if you're interested in more Njiqahdda related releases, they've got a ton of great stuff. we wish to establish contact with you. Music Review: Kuxan Suum's self-titled LP. Free Music Friday: Crowhurst's "No Life to Live"